Katatas Pulong, of course, is a mere pen name of no other than former 4th District provincial board member Sonny Pulgar, a native from Calauag, Quezon. 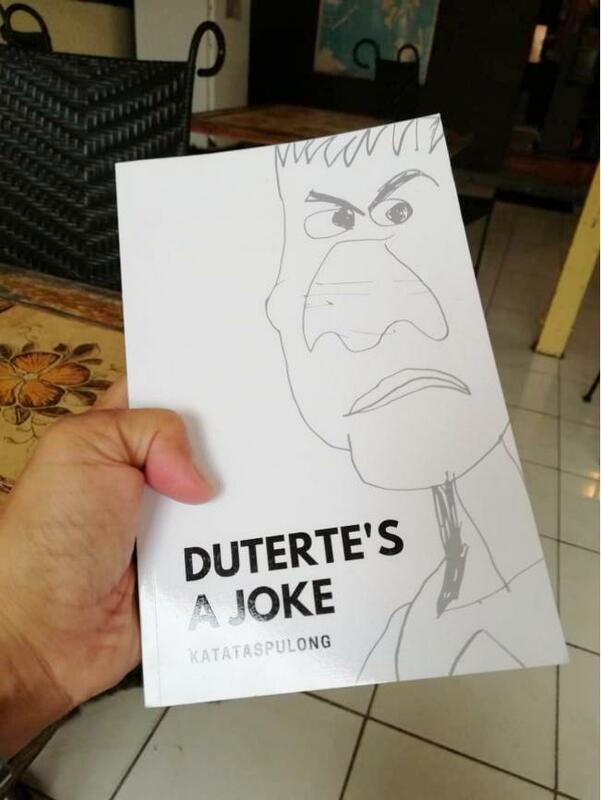 He has written early this year a helluva book entitled ‘Duterte’s A Joke, a 357-page book of rambunctious, no-holds-barred satirical, sarcastic and disgustingly lovable political tirades over anything about the ‘old man from down South’ since his assumption to the presidency in 2016, about the political personalities associated with him and about the institutions under his grip. 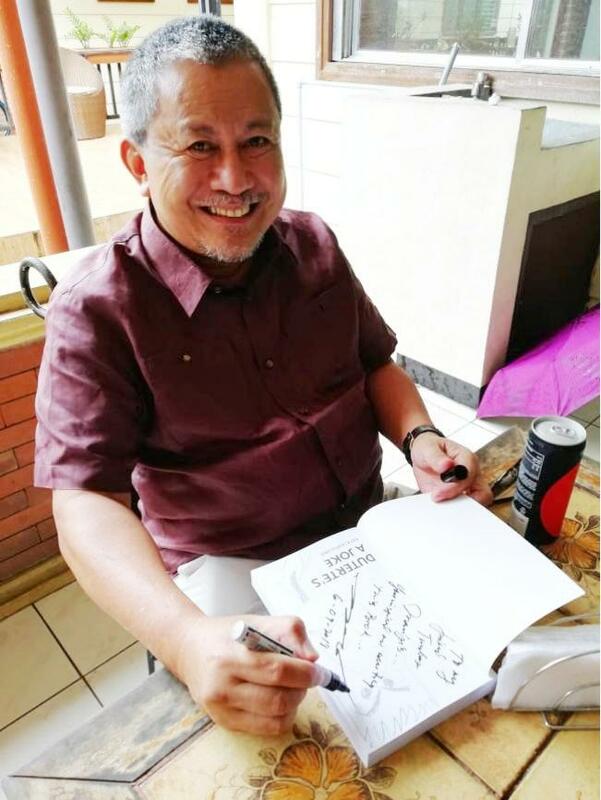 The Foreword in the book says about why he has written it: “I have always intended ambitiously to write a magnum opus on History in the tradition of Teodoro Agoncillo or Nick Joaquin or Onofre D. Corpuz. But I was sidetracked by the baritone monologue of Rodrigo Roa Duterte beginning in 2015. Some lesser historical figures merit a passing mention in history. One former rebel famously said that while he had not become President, he comforts himself to being a footnote thereof. Each leader or President is assured of a slot in a nation’s history. This is one of a kind of a book narrative for Pulgar who writes an opinion column in several local weekly newspapers oftentimes in tandem with, ahem, Tumbas Manipis who also writes his own brand of opinionating that passes for a column. Katatas Pulong and Tumbas Manipis have written side by side in our previous incarnations in such local newspapers as Millennium Times, Peninsula Post, Southern Tagalog Bulletin, Monday Times and others I could not anymore remember with the speedy passing of the times. In his dedication to me for a complimentary copy of his first book, Pulgar writes on June, 09, 2018: To my friend Tumbas Manipis . .. You inspired me writing this book. In his opening salvo, right on page 3 of the book, Pulgar essayed the favorite Pinoy expression and made the rage with the assumption to power of Duterte: Putang ina. It is written in old fashioned Tagalog with even hispanized spelling of such words as medio for medyo, maguing for maging, memoria for memorya, kapaliguiran for kapaligiran. When I pointed this out to him, Pulgar said he wanted to revive Tagalog during Rizal’s time, the way the national hero himself writes Tagalog although we know that he had written his two masterpieces Noli Me Tangere and El Filibusterismo in Spanish as he was not well-versed in Tagalog language. ‘Putang-ina’ started off with this paragraph: May nagsaliksik na kapag ang isa raw tao ay palamura, may angking talino raw. Ano naman ang primerong mura ng Pinoy? Op kurs, Putang Ina. If you are not a reader or not updated in reading current issues of the day you will be lost in the shuffle or in sheer wordplay. Because, pray tell, if you don’t know about Leila and Sandra, which of course, refers to the jailed senator Leila De Lima and jueteng whistleblower Sandra Cam, and if you don’t know the underlying naughty connotation of come which is obvious why Pulgar highlighted it with all caps, then who can help you? Take another one. ‘What’s the difference between PNoy and Duterte? Itatanong pa ba yan? Eddie supot yung isa!’ If this is not slyly malicious but funny to you, I don’t know about you. That is just the first collection of jokes in the breathless series that run up to Joke No. 91 in page 355 and on the last page you can read the following: Quo Warranto sa SC; Quo Palin si Duterte; Quo Lugo si Calida; Quo Rakot sa Kongreso; Quo Vadis ang PH? I would advise everyone, especially the political class who seems to have no sense of humor, to read Pulgar’s book which is a whole caboodle of original political jokes that make fun without mercy about the president, about congressmen, senators, cabinet members, about our policymakers, most of them newsmakers and shakers, about our revered institutions and many of these jokes almost border on the libelous, but could just be ludicrous and ridiculous, and the author, being a lawyer, is seemingly nonchalant about it so long as he could put them to their proper places or reduce them to their human selves who are prone to sin, wrongdoing, pretensions, delusions and misdirection all designed, of course, for their own self-aggrandizement and benefits and never ever for the country’s good.